Haruma and Choco see something about a white tiger on TV. Choco starts to get upset, so Haruma changes the channel. Choco reminds Haruma that he has to go to school so he leaves. On the way out, he sees Chitose, who’s noticed that Choco is sad. She suggests that they go to an amusement park, because she has tickets and things that it would make Choco happy. Choco goes to the place where Kuro used to live and looks at it sadly. Kakeru and Yurika come to see her. Yurika gives Choco the new Neko Nyan Dance CD as a present. Kakeru also gave her a present (some kind of food, but I didn’t catch what.) 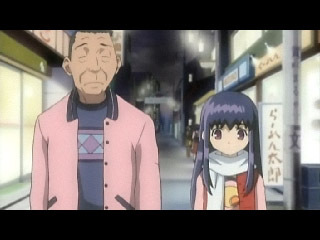 Later, that creepy-looking old man talks to Choco, also noticing her sadness. Choco explains that she’s sad whenever she thinks about Kuro, but she doesn’t want to forget him. The man suggests that she think of all the fun she had with Kuro. He takes Choco back to the apartment building and goes to his room, where he looks at a photo, in which the faces are covered by a glare. After that, he goes to Master’s bar. Master says, “That’s right. Today is your wife and daughters…” but we don’t get to hear what, as the man simply nods in acknowledgement. He hears Choco talking to Makoto excitedly outside. They’re headed to the amusement park, along with Haruma and Chitose. Once there, They enjoy the various attractions (or at least attempt it, as Chitose gets sick on the roller coaster and both she and Haruma are scared in the haunted house.) They stop for a luch break and remember back to how Makoto ound up joining them. When she heard that they were going to the amusement park to cheer up Choo, she immediately volunteered to come. Chitose explained that she only had three tickets. Makoto acted pathetic, reminding them that she didn’t get to go to the onsen or pool with them. Out of guilt, Haruma and Chitose let her join them. In the present time, Choco gets up to go to the bathroom, but when she’s done, sees a little girl crying. Meanwhile, Creepy Guy (I probably shouldn’t call him that, but until I can learn his name, I’ve got no choice) gets off a bus, carrying flowers. Choco talks to the girl and finds out that she’s lost. She volunteers to help the girl find her mother. Haruma and Chitose are starting to get worried because Choco hasn’t gotten back yet. Chitose goes to check the bathroom, but reports back with no luck. Haruma goes out to look next, telling the others to wait in case Choco returns. Makoto decides to go look too, leaving just Chitose. Choco and the little girl wind up trying to look from the ferris wheel. They still have no look, so Choco checks her notebook for a solution. The girl is starting to get cold, so Choco gives away her scarf. Eventually, her mother shows up. In the meantime, it turns out that Creepy Guy is at a grave site. Apparently, his wife and daughter are dead. 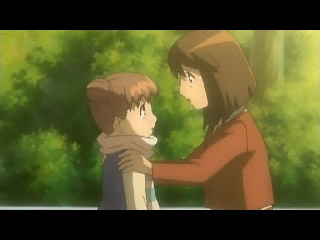 The little girl’s (Yuki’s) mother talks with Choco. Yuki’s father is dead. Choco thinks that Yuki would be lonely and feels bad. Her mother says that she herself is very lonely because the person was dear to her. However, their memories keep them happy. Choco thinks of Kuro. She’s interrupted when Haruma calls her. He, Makoto and Chitose are waiting for her. Yuki and her mother have mysteriously disappeared. 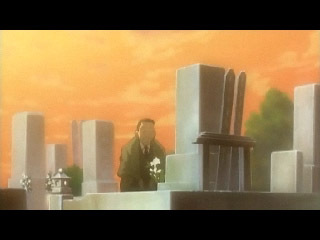 Creepy dude gets ready to leave the grave site, but he notices that the scarf that Choco gave Yuki has appeared there. On the way home, Choco and Makoto fall asleep on the bus. Haruma thanks Chitose for the day, because Choco became happier. Later, CHoco writes about the day in her journal, along with an entry about a dream she had where she was with Kuro. The cuteness is back. This was a bit on the freaky side with the ghosts, but it was pretty interesting. I had expected pretty early on in the episode that Creepy Dude’s wife and daughter died. 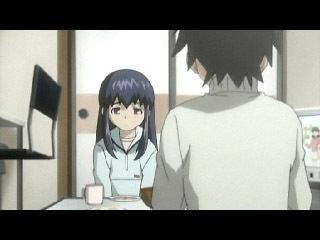 It surprised me though that they were Yuki and her mother. I was also a bit surprised by how much of a follow up this was to the previous episode. After seeing the preview, I thought it was a bit weird that they’d go straight to happiness after what happened last week, but I was glad that this wasn’t the case. In the beginning, Choco was still very upset, but this was really about how she dealt with the death of Kuro. With the help of Creepy dude(I must force myself to look up his name), who had also lost people close to him, as well as the ghosts of his family, Choco was able to get over it. I’m sure she’ll still miss Kuro, but she can now move on and become a maid next week for some reason. Chitose will also be joining her. The next episode looks like it will be full of fanservice, but for all those with a meido-complex, you won’t want to miss it. Hopefully there will be some plot development too. There’s only three episodes left. Knowing this type of series, they’ll probably cram an ending into the final two episodes, which will be painfully rushed but for some reason I’ll wind up liking it. Hope that’s the case. Acording to the manga, his name is Yasuoka (most likely his last name).